/ Mute Spammers in your Twitter “Mentions” Feed? Ah yes, the spam, scam and fakenews fiesta that is the modern world of Twitter. Ya know, Facebook gets into all sorts of trouble for the quality of its feed, but Twitter seems to have some sort of immunity, which is lucky for them. Which isn’t to say that Twitter hasn’t put in a lot of effort to improve things. It’s just that it’s hard to notice how things have improved and where you can engage more aggressive filtering. For example, did you know that you can set up word filters such that anyone who mentions a word, name, company, band or uses a specific obscenity that you particularly loathe would automatically get filtered out? It’s even smarter than that; if the people you follow use it, you’ll still see their updates. It’s the great unwashed that you’re screening in this instance. I’m going to look at the “Notifications” tab here, which is a great way to keep up on the subset of what’s happening on Twitter that references your own Twitter handle or account. My Twitter ID? 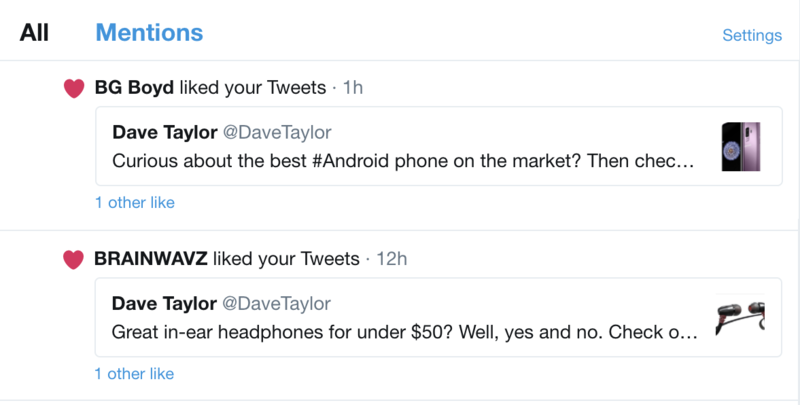 Well, since you asked… follow me at @DaveTaylor. Thanks! If you’re like most people, you immediately started reading the tweets themselves. But… what we want is on the top right of this area. See “Settings” up there? Click on it! While we’re here, let’s filter out a word too, just so you can see that it’s pretty darn easy to accomplish. Click on the tiny print “Mute specific words from your notifications and timeline.“. See it just above the “Save changes” button? Click. So if I don’t follow you and you use the word Nazi in a Tweet that also mentions me, I wont’ see it! Finally, a way to stop people telling me I’m a grammar nazi! Between these two tools you should be able to definitely get a handle on your Twitter notifications stream! Pro Tip: Please check out our extensive Twitter help area while you’re here, and hey, why not follow me – @DaveTaylor – on Twitter too? Thanks!